I went into this sequel really holding my breath because I really enjoyed the original film, Kingsman: The Secret Service, a lot. It was original and unexpected with a couple of scenes that will always be remembered (church and exploding heads). However, the trailers for the follow up had me concerned because they had not grabbed by interest. Because of this, I intentionally avoided reviews and Rotten Tomato scores until I saw the film myself. It is nowhere near as great at the first Kingsmen film was, but there are entertaining moments with some good characters, engaging actors and decent action to make the trip to the theater passable. It will not be remembered as fondly as the first one was, but it did not have to be. We returned to the world of the Kingsmen with Eggsy (Taron Egerton) being attacked and pursued by former Kingsmen-wannabe Charlie (Edward Holcroft). The action immediately ramps up and we see some exciting action from Eggsy before he shakes Charlie off. However, Charlie is able to track Eggsy to the Kingsman headquarters and this led to a missile attack taking out almost the entire Kingsman force. Her plan is to taint the illegal drugs she sells with a poison that gives everyone who uses them a terrible disease that will eventually kill them, and she will only release the antidote if the world bows down to her demands. Meanwhile, Eggsy and Merlin (Mark Strong) followed a lead to Kentucky where they find the American cousins of the Kingsmen, The Statesmen. The Statesmen are agents using a whiskey company to hide their activities, much like the Kingsman organization runs from out of a suit shop. The Statesmen we meet include Tequila (Channing Tatum), Whiskey (Pedro Pascal), Champ (Jeff Bridges) and Ginger (Halle Berry). I enjoyed what little we got of the Statesmen in this movie and I would have liked more. With the exception of Pascal, we only get a little bit of the others, which, considering the film really promoted the fact that the film featured Channing Tatum, could be considered a bait and switch. 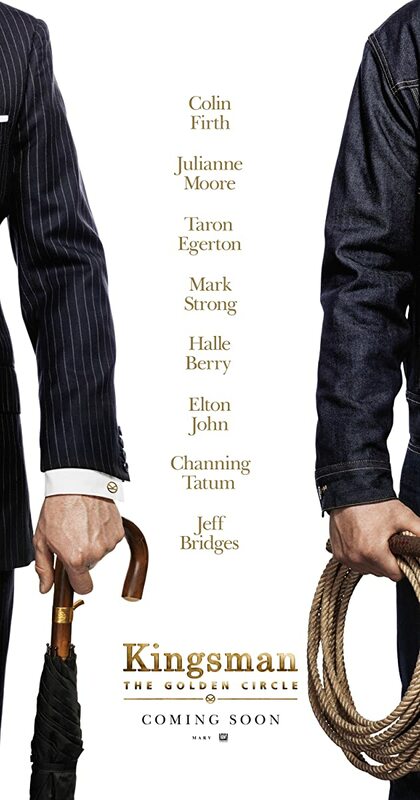 Tatum is in about 10 minutes of the film with Bridges appearing even less. When they are there though, they are solid additions to the cast. Taron Egerton is once again very excellent here as the more out-there James Bond. There are some good scenes with Eggsy and his girlfriend, Princess Tilde (Hanna Alström) and, of course, there are great scenes with Egerton and Colin Firth. So lets address that. Colin Firth is in this movie despite being killed off in dramatic and seemingly final fashion in the original. We saw this in the trailers that he would be back as Harry Hart and how the film brought him back to the land of the living would be important. Without spoiling it, I have to say the way the film did it was pretty disappointing and not up to the level I expected. Some might even go as far as to say that the return of Harry Hart cheapens the original movie because it took a lot of the film’s emotional beats away by not having the character remain dead. I am not sure it was necessary to have Harry brought back. In fact, I think his return from the dead kept me from having an emotional response later near the end of the film when something else happened that should have had a greater impact than it did. Not only was the actual way of saving his life pretty eye-rolling, but why Harry had not returned to the Kingsman was also addressed and it is very soap opera-like. In the end, this part of the film was a definite weak point. Julianne Moore as your over-the-top villain was also a hit and miss. While she was great as the crazy villain, many of the things she did felt very cartoony. Though I liked her as an actress, her character was lacking in many ways. And the movie itself really seemed as if it was trying to outdo itself from the ending of the first film. The violence was too implausible, almost being too comic book like for the film. Sure the film owes its inspiration from a comic book, but it was always more of a spy film than a super hero one, but some of the fights make you wonder. Trying to top the original was something that it should have thought twice about. There are still many moments of good humor and solid performances from the actors here. I liked what I got of the Statesmen and much of the action was fast paced and good. While no where near as great as the first one, this film was okay.